After the intensity of Women in Translation Month, there’s a tendency to go back to what you know (I do have plenty of great books by men on my shelves too…), so I thought it would be nice to set aside another week to make sure I continue to try female writers’ work too. Having also neglected my Korean reading a little recently, I found the perfect solution by making the first week of October a personal Korean Women Writers’ Week. Watch out this week for five writers, three books and three posts – starting today! 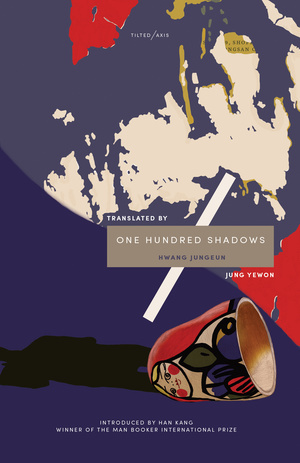 Hwang Jungeun’s One Hundred Shadows (translated by Jung Yewon, electronic review copy courtesy of Tilted Axis Press) is a contemporary Korean novel, narrated by a young woman called Eungyo. She works at a shop repairing old appliances, and in the course of her duties, she often runs into Mujae, a young man working at another shop on a lower level of the large, old building her shop is located in. The two get along well, and part of the interest of the novel is following a slow-burning love story between two nice (shy) people. Tilted Axis Press is a new publisher, set up to provide voices for writers from the margins. With Deborah Smith, translator of Man-Booker-International-Prize-winning The Vegetarian, at the helm, it’s little surprise that one of their first books comes from South Korea (there’s another link here to The Vegetarian in the form of a short foreword from Han Kang herself). The website introduces One Hundred Shadows as ‘an oblique, hard-edged novel’, which is actually slightly misleading – there’s nothing hard-edged about this book. It was my father who got me the job at Mr. Yeo’s repair shop, through a loose thread of acquaintances. I left school when I was seventeen. I went through some things – bullying – that couldn’t simply be dismissed as the usual kid’s stuff. The fact of being a school dropout is one of many things which connects Eungyo to Mujae, and she comes to enjoy his sporadic visits to her shop. Their relationship extends beyond work to walks in the woods, weekend outings and evenings spent at cheap noodle joints nursing beer and makkoli rice wine. There’s nothing physical in their expressions of love, but in the time they spend together, we can see how close they’ve become. Korean novels can often be full of rage against iniquity and inequity, but One Hundred Shadows isn’t one of those books. The writing is beautifully evocative of a normal life, filled with everyday conversations and rain slowly falling on summer days, and the outside world and the wider economy are seen obliquely, if at all. When the decision is made to tear down one of the market buildings, Mr. Yeo and Eungyo shrug their shoulders and life goes on. Even when the outside world does momentarily intrude, in the shape of the boisterous office workers at the local bar, after one casual glance Eungyo and Mujae ignore them – this simply isn’t their story. While you might expect this to sound a little bizarre in the everyday world of the electronics shops, Hwang handles the idea well. It’s casually mentioned, with the topic periodically coming up in conversation, and there’s a sense of the inevitable in that it seems to happen to everyone sooner or later. I saw it as an allegory for letting go, reflecting the moment when life becomes that little bit too much. Sounds excellent Tony – another to keep a lookout for!